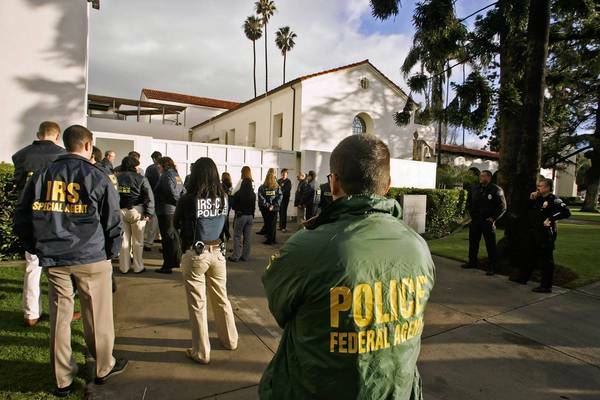 When hundreds of federal agents raided four Southern California museums early one January morning in 2008, it set the art world ablaze, suggesting that even amid an international looting scandal museums had continued to do business with the black market in stolen antiquities. 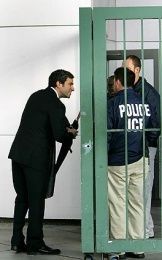 LACMA’s Michael Govan asks federal agents permission to enter the museum on the morning of the January 2008 raids. Acting on evidence gathered during a five-year undercover probe, investigators seized more than 10,000 artifacts at the museums and more than a half-dozen other locations in California and Illinois. The objects had allegedly been illegally excavated from sites across South East Asia, smuggled into Los Angeles and donated to the Bowers Museum in Santa Ana, the Pacific Asia Museum in Pasadena, the Mingei Museum in San Diego and the Los Angeles County Museum of Art, according to search warrant affidavits. But in the years since the high-profile raids, no museum officials or collectors have been indicted, and none of the seized objects have been returned to the countries from which they were allegedly stolen. Days before the statute of limitations on criminal charges were about to expire in January, a federal grand jury indicted two men in the case. Robert Olson, an 84-year old Van Nuys man, and Marc Pettibone, a 62-year-old American living in Thailand, are both accused of one count of conspiracy and one of trafficking in stolen goods. Two peripheral players in the alleged scheme pleaded guilty to similar charges last year. Several people targeted by prosecutors — including Bowers curator Armand Labbe and antiquities dealer Joel Malter — died during the 11-year investigation. A third target, UCLA trained pottery expert Roxanna Brown, was indicted in 2008 and died from health complications while in federal custody, leading the federal government to settle a lawsuit brought by her family for $880,000. In recent interviews, several people with direct knowledge of the investigation expressed anger and frustration, saying the case had languished in the U.S. Attorney’s office. They described Assistant U.S. Attorney Joseph Johns, who has directed the case since its inception, as overzealous, eager to send federal agents into museums to gather evidence but too distracted or overwhelmed with other cases to bring timely criminal charges. As a result, they say, the case has wasted millions of dollars and inadvertently encouraged the very black market it targeted by suggesting the government is weak on enforcement. The sources spoke on the condition of anonymity because they were not authorized to comment and feared imperiling the criminal case against Olson and Pettibone, which is set to go to trial in June. Inflated Art Appraisals are Rampant: You Say That Art Is Worth How Much? And the indictments and plea agreements for the “peripheral figures” mentioned in the story. This entry was posted in News and tagged Armand Labbe, Ban Chiang, Bowers Museum, Cambodia, Joseph Johns, LACMA, looting, Marc Pettibone, Mingei, museum raids, Pacific Asia Museum, Robert Olson, Roxanna Brown, Stephen Urice, Thailand. Bookmark the permalink. Sloppy investigative work, shortcuts targeting some people incorrectly, grabbing headlines without proper backup and inaccurate implimentation of the law resulted in this ineffective mess in California. And a payout of taxpayer money to the family of the elderly lady accused …..who died in custody makes the government look both incompetent and AAA adjenda driven. Hardly an effective way to rid the world of the looting epidemic.